There are always those bands and albums in our collections which we consider to be old reliables when we’re in the mood to brood. The perfect album sits right there for us to turn to for comfort or escapism. At other times, we just want to sing – like really sing our hearts out – to that perfect pop song at the top of our lungs. 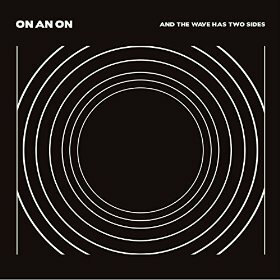 Minneapolis’ ON AN ON encapsulates both of these times by exploring themes of duality on their sophomore album And The Wave Has Two Sides. Album opener “Behind the Gun” carries forward the band’s lo-fi grit from their previous effort Give In, and is quickly followed up by singer Nate Eiesland’s simple emotive serenade on “Icon Love.” These tracks feel sparse but ON AN ON has learned to say more with less in a perfect marriage of fuzzy and shimmering instrumentation in their electro-pop realm. The album has some definite anthemic moments (“It’s Not Over” and “Stay the Same”) that try equally to cling to the past and break out towards something new. Amidst the ebb and flow of the album, perhaps the loveliest moment comes right at the midway point with the first single “Drifting,” whose title connotes a directionless wandering that is neither here nor there but rather an aimless indecisiveness – quite the opposite of a definitive duality. Eiesland builds up this disorienting feeling to its apex and then moves in a clear direction to escape it, but then abruptly awakens to a reality that only underscores it. This track is not only a poignant insight into ON AN ON’s entire album but also the two faces of the band (transforming from Scattered Trees to ON AN ON and transitioning from Give In to ATWHTS). To us, all facets of ON AN ON’s efforts are equally beautiful.